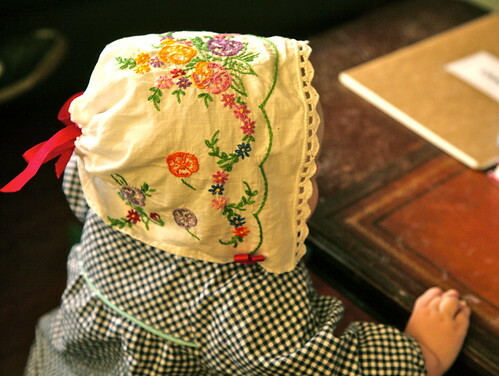 Inder Loves Folk Art: Bonnet. 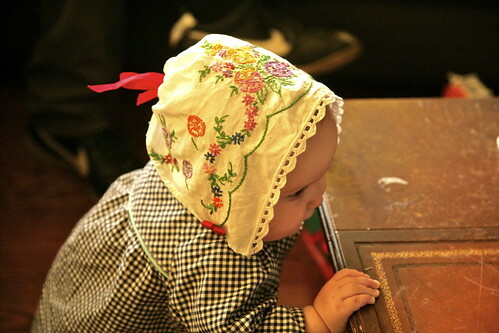 Remember that beautiful bonnet that my friend Christine made for me? From a vintage embroidered pillowcase? It's officially the most darling thing on God's green earth. I mean, I almost have to shield my eyes from the unbearable sweetness. The only thing cuter is Little Miss Maggie herself, of course. She has such soulful eyes and the sweetest crooked smile. And a calm and sunny disposition. She has a certain quiet, observant, peacefulness about her that people constantly remark on. But believe me, when she wants a thing, she lets you know all about it. For example, don't even dream of eating in her presence without offering her a little something. I mean, that is just rude. She is also saying "mama" and "dada" and clapping, and signing for "more." At least, I think so. It's a bit early to say for sure. It is so fun to watch how siblings develop. Maggie and Joe are so similar (especially in looks!) and yet, also very different people. They love each other so. Maggie has Joe wrapped around her little finger. We spend our days trying to restrain Joe from loving Maggie too much, too constantly, and too smotheringly. In desperation, I have been known to say, "For crying out loud! Joe, can't you find something to do besides hugging and kissing your sister?!" They spend their days making each other laugh. No one makes Maggie laugh the way Joe makes Maggie laugh and Joe delights in her giggles. They have a special bond. This bonnet goes so perfectly with this Class Picnic Blouse that I made Maggie a while back and never officially blogged. These photos don't really show it off either, but suffice it to say, I love this pattern. I used aqua piping and facings on the hem, neck, and sleeves (which I elasticized to make them puffy), and it turned out so perfectly folksy-modern. I love it, and I want to make more. I also think it would be adorable lengthened into a dress, don't you? Stay tuned. I have plans. oh the cuteness IS too much! and that sibling bond is really something, isn't it?! i just love to see the way my kids love one another. so many great life lessons learned there. of course, they fight at times, too, but those lessons are important as well! 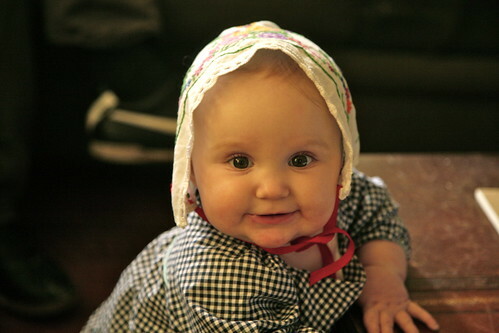 Oh my goodness Inder that bonnet and that face together are too much!! I love the gingham and aqua together in that blouse. I don't have this pattern, but i've eyed it up several times, along with many other oliver+S patterns ;) (Incidentally, the geranium and the peekaboo bonnet are a lot of fun to make :) ) And, how much fun is it to watch that sibling love evolve! It does make your heart melt doesn't it? "Darling" is the perfect descriptor! She oozes cute! Oh classic timeless baby cuteness!! Bonnet! Gingham! Cheeks! Eyelashes! Eep! 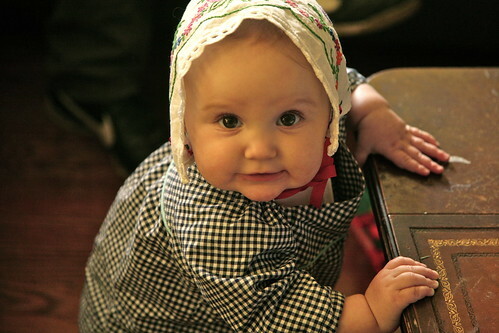 She is utterly adorable - love the bonnet and the top (one of my fav patterns too). Oh, my cute as a button. And the bonnet is fantastic too! So cute! The class picnic blouse makes a wonderful nightgown, too, when your daughter is old enough to need one! Just draft an A-line skirt onto it, starting at the armscye. What a lovely post. She is so precious! I'm so glad the little bonnet is being loved :) It's living the life I dreamed for it when I cut it out so long ago <3 More darling than I could have imagined though! And the gingham is just perfect.